My story is very long. We wanted to do a beach wedding but we decided to get married in Dec. How can I glam my beach wedding dress up a little? That's a loaded question. The reason I say that is because a lot depends on the formality and location of your wedding. For instance, if your wedding is informal and you just want to add a little sparkle to your dress... you can add sequence and clear or iridescent seed pearls or beads to the gown. On your gown I would suggest you highlight the floral print areas with the gems. You can either hand sew them on or glue them using a beading glue that dries soft and crystal clear. But if you are now having a formal wedding in a formal setting... then adding beading and gems will not makeover the dress enough to be appropriate for that type of wedding. It will still look beachy, but with bling, if you get what I'm saying. If this situation sounds like you I would strongly suggest that you get another wedding gown. Plus there is another thing you need to think about. When an informal wedding gown is used for a formal wedding, you run the risk of your wedding party and guest out dressing you! Essentially they can upstage you at your own wedding and I imagine that this is not something you want to happen. So to recap... if the formality of your wedding is informal you can glam up your dress. But if the reason you want to glam up your gown is because you are now switching to a more formal setting... 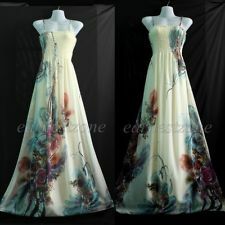 I suggest that you choose another dress since the floral print keeps the gown informal. Now I need to find a plus size dress for December wedding. Well the groom decided to do a tux so my mom is like he will not out shine my baby. So now we was thinking of adding gems or pearls to it but... I just dont know now. The event went from informal to an semi-formal(I guess). I have to say that your mom has a valid point. Wearing a tux is for formal events. In order to keep your groom from outshining you he will need to wear a nice suit at most. But if he has his heart set on a tux, you will need to get a more formal gown, so that you won't be out of place at your own wedding. Nowadays, there are no hard fast rules about what's proper or not when it comes to weddings. So basically, a couple can do what they want to do. But... have you ever been to a wedding where nothing really went together? It seemed that there was no planning, but just a hodgepodge of stuff put together? If, you have, what did you think about that wedding? Those weddings are memorable, but for the wrong reasons. People notice when things are in sync as well as out of sync, whether you plan it to be that way, because you want to be different, or not. So here's the deal... if you don't want people to come away from your wedding thinking mostly about how sharp the groom looked, then you need to help him see that he should wear a suit so he won't take away all the attention from you. It's still a fact that at a wedding... it's the brides day to shine! So if he is agreeable to wearing a suit, you can wear the gown you have and add beading to glam it up, if that's something you still want to do. But note this... adding beading to the gown is not going to make that dress on the level with a tuxedo. The print on the dress fabric makes it a more informal or semi-formal wedding dress. A tuxedo, on the other hand, is usually not worn to informal or semi- formal events. They are usually worn for what is termed "formal" events. So when it comes to some things like the formality of an event or wedding, the rules for the attire still apply. Staying within in these rules for a wedding makes it a "polished" harmonious event. But hey, if it's going to be a problem getting the groom to change from the tux and you don't want to change your dress, and if it's not a concern for you that he may outshine you in some guests eyes... then by all means do what makes you both happy! I hope I've been helpful. I wish you well in your decision and in the rest of your wedding planning.